This new report entitled “The Economic Engagement Footprint of Rising Powers in sub-Saharan Africa: Trade, FDI and Aid Flows” published by the Institute of Development Studies sheds new light on the role of Rising Powers in Africa. While there has been a lot written about China (rightly so as it is the biggest outside influence on the continent), companies from countries such as Brazil, the Gulf States and India have swooped in under the shadow of Beijing, stepping up their trading and investing activities and even providing significant aid programmes across Africa. I have been documenting these new relationships on this blog, but it is brilliant to see more coverage and analysis of this trend. As South – South trade continues to accelerate we can expect to see more written about the subject as commentators move beyond the China – Africa axis to examine relations between other emerging markets. Perhaps the most interesting section in the report is the analysis of the fast growing Rising Powers’ development programmes or “South-South cooperation” which are purposely different to the Western model guided by the OECD DAC principles. These new donors emphasis mutual benefit and cooperation, rather than the aid packages and budgetary support offered by the West. China uses infrastructure development; building stadiums, hospitals and most notably in Africa, the new African Union HQ in Addis Ababa – this approach creates a powerful impact, given its widespread visibility, but many complain that the work is done by Chinese companies and labour and locals miss out on employment possibilities as a result. 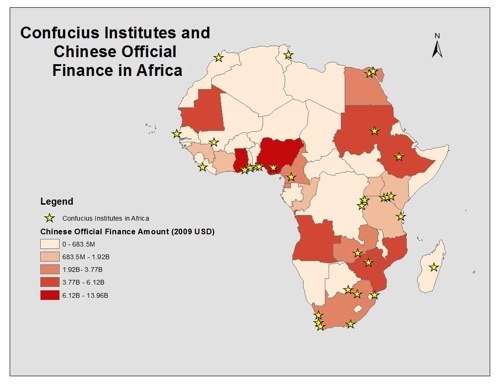 This type of aid also gets mixed up by the media with Chinese backed commercial projects, leading to exaggerations of China’s aid programme and accusations it is “bribing” African governments. The Chinese Commerce Ministry does not help by being secretive about the levels spent in its aid programme, but concern that pulbic opinion in China would be outraged if it knew how much their government were spending on overseas aid could be behind this secrecy. India uses the phrase “fair relationship” to describe its engagement with Africa and emphasises access to markets, health and education knowledge in its overseas aid program. Again this is a sensitive subject given India’s own massive poverty problem (why should New Delhi be spending money abroad with millions at home facing such serious problems). The answer may lie in India’s competition with China for natural resources on the continent, with an implication that providing aid will lead to African governments looking upon Indian firms more favourably when awarding mining or drilling licences. This is difficult to prove as Indian aid is benefiting East African countries that its companies would be naturally targeting in any case. Brazil, the South American country has used the terms “horizontal cooperation” to describe its aid programme with Africa and has provided technical assistance to a host of Sub-Saharan African countries, in other words advice via consultants or experts to help these states improve their potential in sectors like agribusiness, see my post from last year, an area in which it has a strong comparative advantage. South Africa, the continent’s richest country recently started a modest overseas aid program, last year I met one of the advisors who had help start the programme, she explained that they hoped to use development lessons learnt in South Africa and apply them in neighbouring countries. Although all these programmes remain small for now they represent the future of international development as we move away from a western orientated world, so it is fascinating to see how they operate, as I predict we are going to see and hear much about them. One country which unfortunately did not feature in the report, understandably as it is not considered a “Rising Power” but has invested heavily in Africa, is Malaysia. Malaysia’s engagement in Africa is one of the great untold stories of the continent and I will taking a closer look in the near future at how companies from the Asian nation have ramped up their presence in South Africa, Kenya and many other countries. Previous Previous post: China is the Number one Trading Partner of all the countries in red. Next Next post: Chinese Tourists are Going Global, How Can You Benefit From This Trend?